Progressive frontal- and temporal-lobe features are seen in many nondegenerative conditions and need to identified, as they are treatable if diagnosed early. These include infections such as neurosyphilis, Vitamin B12 deficiency, frontal-lobe tumors, normal-pressure hydrocephalous, and other subcortical dementias.,,,, Cerebrotendinous xanthomatosis is a recessively transmitted disease first described in 1937 by Von Bogart et al. as an inborn error of bile acid metabolism. Symptoms are first seen in late childhood with diarrhea, cataract, seizures, psychiatric manifestations, dementia, ataxia, respiratory distress, premature atherosclerosis, osteopenia, and xanthomas in lungs and tendon sheaths. Later, they show features of ataxia, dysphagia, dysarthria, neuropathy, myopathy, spastic gait, and dementia. There is deficit in the synthesis of bile acids, leading to increased hepatic production of cholesterol and cholestanol which accumulates in the tendons and brain. Serum cholesterol may be normal. Tendon xanthomas contain cholesterol with about 9% dihydrocholesterol form. CYP27A1 gene in chromosome 2q33-qter with 9 exons codes mitochondrial enzyme sterol 27 hydroxylase. There is cytochrome 450 loss of function mutation which is involved in bile synthesis. About 300 cases have been reported worldwide, and there is no consensus regarding the prevalence. The usual time delay for diagnosis is about 16 years. Multiple fractures are reported in literature due to osteoporosis and reduced calcium absorption. To improve the suspicion of clinical diagnosis, a “suspicion index” has been devised. There are no diagnostic criteria, but the unique phenotype needs to be recognized. Classical progressive frontotemporal phenotype is reported as the only manifestation in a single case.,, Long-term treatment with chenodeoxycholic acid (750 mg/d) started before the neurological symptoms develop is recommended. However, very gross delay in diagnosis and substitution in azodeoxycholic acid is the cause behind the usual poor outcomes. A 40-year-old female, born to consanguineous parents, was dull in studies compared to her three siblings. At the age of 29 years, she developed swelling over both tendo-achilles, which was treated at multiple centers both medically and surgically. However, the swelling recurred and the new ones appeared. At the age of 30 years, she was found to be hypothyroid and treated with hormone replacement. At 32 years, her speech was slightly slurred, became dull, and had repeated falls while walking on uneven surfaces. This led to fractures of both bones of forearm, 1st metatarsals, clavicle, and right femur. At the age of 34 years, her relatives noticed that she was having procedural memory problems in activities of daily living. From the age of 37 years, she was found to misplace objects; not mingling with relatives; speaking very few words with low voice volume; unable to remember events which occurred few days ago; not interested in bathing, brushing, and dressing properly, suggesting memory and executive function impairment. She had aimless wandering, hoarding, excessive anger, and suspiciousness. From the age of 39, she was found to be passing urine in inappropriate places and later stools. With the onset of these symptoms, she was referred as a case of frontotemporal dementia (FTD) to our center. Examination showed a short-stature, apathetic person with a haggard face. She had a small goiter and multiple swellings over the both tendo-achilles, which were firm in consistency and measured about 7–10 cm [Figure 1]. She had multiple deformities in the limbs due to malunited fractures. She had clubbing of fingers of both hands, cataract, and wide-based gait with ataxia. Her Hindi-Mini–Mental State Examination score was 18/31. Investigations showed normal thyroid function, Vitamin B12, HIV, and Venereal Disease Research Laboratory (VDRL) tests. Vitamin D2 ergocalciferol was 1.27 ng/ml, Vitamin D3 cholecalciferol was 20.64 ng/ml, and total Vitamin D level was 21.9 ng/ml. Parathormone level was 19.7 pg/ml. Cholesterol levels include the following: total cholesterol – 221 mg/dl; high-density lipoprotein – 31.1 mg/dl; low-density lipoprotein (LDL) – 156 mg/dl; very LDL – 34 mg/dl; phosphorus– 4.6 mg/dl; calcium – 9.67 mg/dl; and homocysteine – 7.54 mmol/l. Liver function test and renal function test were normal. Cholestenol investigation was not done due to lack of facility. Autoimmune and paraneoplastic workups were negative. Visual-evoked potential, auditory brainstem EVOKED response, sensory-evoked potential, nerve conduction study, and electromyography were normal. Her electroencephalography showed slow waves of theta range seen mainly over the bilateral fronto-central regions mixed with a burst of asymmetrical, asynchronous, mid-positive, triphasic waves with anteroposterior gradient. Her magnetic resonance imaging showed diffuse atrophy more pronounced over the frontal and temporal regions as well as cerebellar vermis. There were no dentate nucleus signal changes [Figure 2]. X-ray of her bones showed multiple malunited fractures with severe osteopenia [Figure 2]. Neuropsychological evaluation showed impairment in attention, comprehension, fluency, new learning, and executive functions. Her Addenbrook's cognitive examination (ACE) score was 38/100. Genetic testing with whole-exome sequencing showed TREM2 (-) (ENST00000373113) Exon 2 c.377T>G (p. Val126Gly) homozygous autosomal recessive. This patient showed severe osteopenia, multiple malunited fractures, tendon xanthomas, mild elevation of cholesterol, and LDL. Her imaging showed diffuse atrophy more pronounced over the frontal and temporal regions. Other causes for dementia and osteopenia were negative. This 40-year-old female had been symptomatic for 11 years on the background of short stature and poor scholastic performance compared to her siblings. She had presented with multiple tendo-achilles swellings and fractures, followed by progressive cognitive impairment involving the frontal and temporal lobes, satisfying the consensus criteria for Behavioral Variant Fronto-Temporal Dementia, as well as mild cerebellar features. A possible diagnosis of cerebrotendinous xanthomatosis was made and treatment was initiated with azodeoxycholic acid as chenodeoxycholic acid is not available elsewhere. She is on treatment for just 1½ months and has not come for the first follow-up yet. Xanthomas are seen in conditions associated with dyslipidemia, amyloid, histoid hansens, histiocytois, fungal infections, etc., but the unique combination of tendon xanthoma, fractures with osteopenia, ataxia, dementia, endocrine dysfunction, and cataract are typical of cerebrotendinous xanthomatosis. 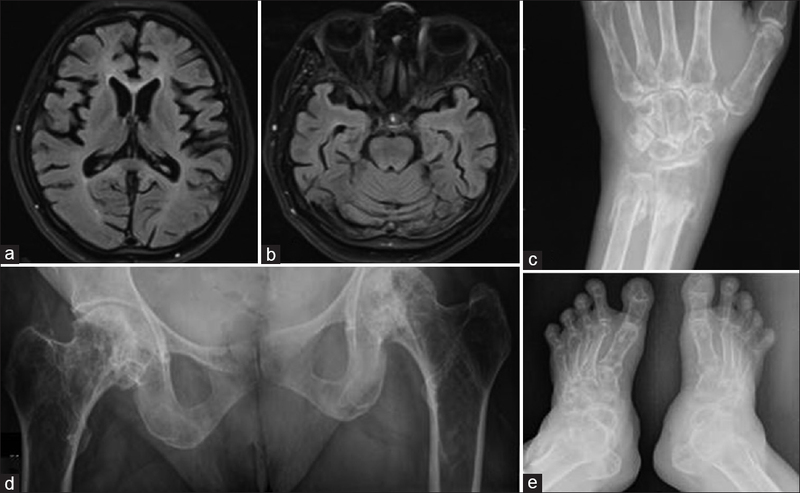 Nasu–Hakola disease characterized by bone cysts and sclerosing leukoencephalopathy and no tendon xanthomas correlates with gene identified in this case. However, none of those features were seen in our case. It is possible that the same gene can produce different diseases, which is well known and needs study of more cases. At the stage when the patient reported to us in view of severe apathy and lack of executive functions, she was repeatedly being diagnosed as reactive depression secondary to recurrent swellings in the legs and multiple fractures. The patient did not respond to the treatment of depression. She progressed to significant cognitive decline with incontinence. At this point, she was diagnosed as probable FTD and referred to our center. These symptoms are the part of the same metabolic disease, which was completely missed at the level of general physician, orthopedician, as well as psychiatrist, further delaying the initiation of treatment. It is always important to look for possible treatable causes before the diagnosis of FTD is confirmed in patients presenting with features of atypical frontotemporal involvement and multisystem involvement. The novelty of this case lies in the fact that the clinical features are typical of cerebrotendinous xanthomatosis, of which only 300 cases have been reported. The systemic features were completely missed when mental illness and FTD were diagnosed. This is rare and treatable. The gene identified is suggestive of Nasu–Hakola disease, but the clinical features do not fit, suggesting a possible expansion of genotype and hence more cases need to be studied. The authors would like to thank the Department of Neurology, National Institute of Mental Health and Neurosciences, Bengaluru, Karnataka, India. McKeith IG, Dickson DW, Lowe J, Emre M, O'Brien JT, Feldman H, et al. Diagnosis and management of dementia with Lewy bodies: Third report of the DLB consortium. Neurology 2005;65:1863-72. Roberson ED, Hesse JH, Rose KD, Slama H, Johnson JK, Yaffe K, et al. Frontotemporal dementia progresses to death faster than Alzheimer disease. Neurology 2005;65:719-25. McKeon A, Marnane M, O'connell M, Stack JP, Kelly PJ, Lynch T, et al. Potassium channel antibody associated encephalopathy presenting with a frontotemporal dementia like syndrome. Arch Neurol 2007;64:1528-30. Thynne K. Normal pressure hydrocephalus. J Neurosci Nurs 2007;39:27-32. Lukehart SA, Godornes C, Molini BJ, Sonnett P, Hopkins S, Mulcahy F, et al. Macrolide resistance in Treponema pallidum in the United States and Ireland. N Engl J Med 2004;351:154-8. Philippart M, Van Bogaert L. Cholestanolosis (cerebrotendinous xanthomatosis). A follow-up study on the original family. Arch Neurol 1969;21:603-10. Nie S, Chen G, Cao X, Zhang Y. Cerebrotendinous xanthomatosis: A comprehensive review of pathogenesis, clinical manifestations, diagnosis, and management. Orphanet J Rare Dis 2014;9:179. Berginer VM, Shany S, Alkalay D, Berginer J, Dekel S, Salen G, et al. Osteoporosis and increased bone fractures in cerebrotendinous xanthomatosis. Metabolism 1993;42:69-74. Mignarri A, Gallus GN, Dotti MT, Federico A. A suspicion index for early diagnosis and treatment of cerebrotendinous xanthomatosis. J Inherit Metab Dis 2014;37:421-9. Guyant-Maréchal L, Verrips A, Girard C, Wevers RA, Zijlstra F, Sistermans E, et al. Unusual cerebrotendinous xanthomatosis with fronto-temporal dementia phenotype. Am J Med Genet A 2005;139A: 114-7. Souza PV, Bortholin T, Naylor FG, Pinto WB, Oliveira AS. Teaching neuroimages: Early-onset dementia and demyelinating neuropathy disclosing cerebrotendinous xanthomatosis. Neurology 2017;89:e134.